Spyglass Hill will open in early 2017. 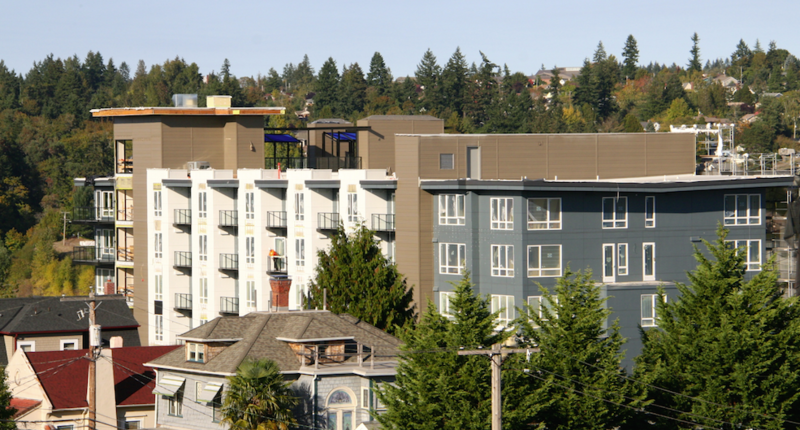 Be it the possibility of property tax breaks or a chance to deliver on Bremerton’s thirst for housing, developers have pushed more than a handful of apartment projects through city hall in recent years. Some are more likely than others to materialize. Here’s a list of those projects, what we know about them, and where they currently sit in the realm of possibilities. Water, Wind & Sky: This one’s new. City community development officials have received plans for a 110-unit complex off Lower Wheaton Way at Schley Boulevard, overlooking the Port Washington Narrows. 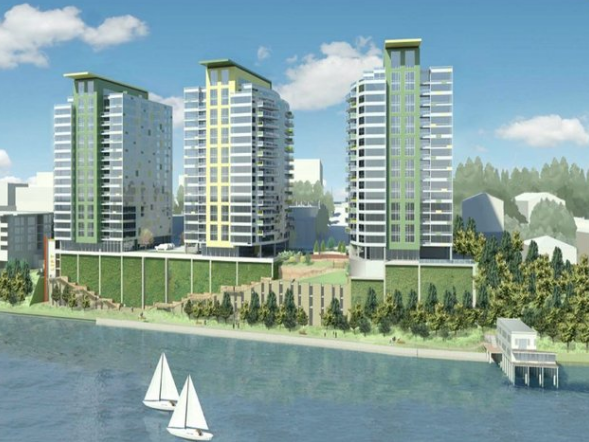 Seattle Developer Mark Goldberg, who spearheaded the 400 Condos in downtown Bremerton, has been working on the project. There’s a city sign up about the project but it is merely at the start of the permitting process. Spyglass Hill: Work is wrapping up on the $15 million, 80-unit project on Highland Avenue (see photo at the top of the blog). It looks like the project, developed by Sound West Group, will open in late winter. Pre-renting has begun. The Wheaton Way Apartments: Work has already begun on the 160-unit complex off Broad Street in East Bremerton. The seven-acre property will be home to 10, three-story apartment buildings. In the future, Kitsap Transit plans to build its new transfer station between the development and Wheaton Way. The 1010 apartments at Burwell Street and Warren Avenue. 1010 Apartments: The Bremerton City Council recently decided to give Lorax Partners, the developers of the 25-unit complex, $210,000 to demolish the dilapidated row housing currently on the property. The federal money to do it won’t come until next year. But the project could get underway once that work is complete. Lorax is the same developer that built the Park Avenue Plaza and 71-unit 606 apartments. 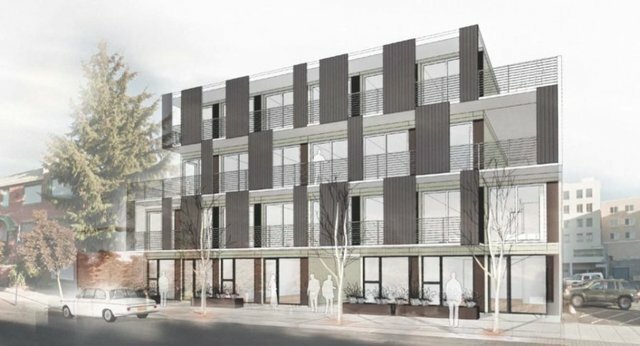 Inhabit Bremerton: The 51-unit project by longtime Kitsap County resident and developer Dale Sperling is being built in blocks in China and will then be constructed at the site of the former Nite Shift Tavern and Evergreen Upholstery. I don’t have word yet for when the “modules,” as they are called, will arrive. But when they make it here, I am told putting them together on site will be quick. Evergreen Pointe: The 104-unit complex would be built beside Evergreen-Rotary Park on Sheldon Boulevard. Goldberg pushed it through city permitting. I’ve talked to Kingston developer Trish Williams, who owns it now, and she’s hopeful to start construction soon but says there’s still some work to be done. Smaller projects downtown: Last, but not least, there are some smaller commercial-retail projects going downtown. Chung’s Teriyaki, under construction near the Bremerton ferry terminal, will have three apartments atop it. And Sound West Group is doing one other project on Pacific: the 707, which is a renovated retail space and five apartments above. That project has cleared the city’s design review board. The Towers: Last but not least, I will mention the Towers, which started as a condo development on Washington Avenue at Sixth Street. Goldberg also steered this one through permitting. It’s now owned by Absher Construction. I had been told of a plan to alter the development to include apartments, a restaurant and hotel. Absher paid more than $200,000 to bury power lines on the street as part of the Washington Avenue project. Where are the lower income apartments for people who can’t $1,500 plus for a 500 sq ft. studio apartments. Where are the lower than $1,500 apartment for people who work but can’t pay that much for rent. Older people need living spaces and young working people. Not to mention most one working person in families. More supply will help ease the pressure on rising rates. There are plenty of apartments at less than $1,500 per month. Its funny how people cry wolf when developers get a tax break yet complain when there aren’t any apartments available. If only there was a way to attract more Seattle money to help develop Bremerton… Oh yeah that fast ferry people seem to have a heart attack about on every Kitsap Sun article. lol. Do you know if any of the apartments will be for sale? Condo’s? Or are these just rentals? Perhaps some in depth analysis of supply and demand for all these units would be wise. It really doesn’t take a rocket scientist to figure out a lot of this won’t be built or will soon be in foreclosure. How do I sign up to get free money from these grants? I’m remodeling my house and really could use an indoor heated swimming pool. Are the waterfront condos even filled yet? I’d be curious as well to know where all these mythical renters are going to come from. Sure, there’s a lot of people here in Bremerton who need a place to live, but not very many of them can afford any of these new apartments. On top of that, anyone living in these apartments can expect their rent to be raised higher and higher every year. Do the builders really think that many people currently living in Seattle are going to move here? Well, I guess we’ll find out. It’s going to be a heck of a thing, though, if these apartment buildings sit empty, especially after all the tax breaks the builders got. Reading some of the above comments makes me understand why this area has not done so well in the past. Former Bremerton resident, now living in Silverdale. Kelly asked where all the people will be coming from to live in these apartments? They will be coming from Seattle, to sidestep their rising prices. Ding, ding – that’s why they pushed for the fast ferry. People need to commute to their jobs, but they wan to live where it is cheaper. Where are the units for low/lower income FAMILIES? who knows. Bremerton doesn’t even repair their streets, the cracks, which are many) are filled with some kind of tar stuff. It looks horrible. Bremerton officials, how about fixing the other areas of Bremerton too, instead of just focusing on the waterfront. And there’s this as well: apparently, when the new apartments go in on 4th between Washington and Pacific, the street is going to be redone. At least, that’s what I last heard. It’s the prettiest street in Bremerton and they want to “fix” it, so it’ll look like all the other ugly streets now.